I pre-ordered. I was *not* disappointed! Great read! 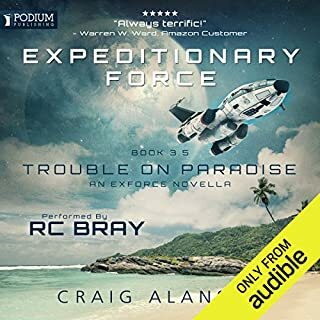 Audible hit a home run for all us Audible sci-fi junkies when they had RC Bray narrate Alanson’s Expeditonary Force series. It’s a chips & salsa killer combo. Keep them coming! Skippy and Joe rightfully enjoy the spotlight as we get further involvement and development of Nagatha and Smythe. Despite derailed soliloquy’s and periodic randomness I thoroughly enjoyed the totality of the book finding myself smiling and laughing a lot. Alanson presents some new characters in the Delta unit sent to take over the Flying Dutchman and sidelines some of the major characters such as Gunnery Sargeant Margaret Adams and “Count Chocula.” While we are introduced to these special forces guys we don’t get to know them very well. We end the book bowing to Craig Alanson’s “awesomeness!” I’m looking forward to preordering another of Craig Alanson’s books. A year after the Commonwealth won the war with the Theocracy, the interstellar cruise liner Supreme is on its maiden voyage, carrying a host of aristocrats thrilled to be sharing in a wondrous adventure among the stars. Then a collision with a pirate ship leaves the cruiser powerless and becalmed in hyperspace. And they’re not alone. Now, the mysterious force that’s living on this floating graveyard is coming for Supreme’s crew and passengers. As madness starts to tear at their minds, they must fight to survive in a strange alien realm. A favorite author has slipped, fallen and lost his luster. It’s as if he had a mediocre inspiration after reading Stephen King and Danielle Steele. Characters are bland. Plots are unimaginative and shaky. The book might qualify to be published with the Harlequin genre, except I don’t think Harlequin fans would enjoy it either. Unfortunately, it(speaking truth to power)didn’t happen by McCabe’s own account. I agree with him that it is unlikely that truth wouldn’t have been/and isn’t appreciated by our current POTUS. The scary thing for Democracy is that I can see myself making the same decisions he(McCabe) made and reeling under the impact of a powerful, intimidating, executive like our current POTUS to whom truth isn’t essential but rather just another weapon to be used in effectively communicating his agenda to a compliant core of cud-chewing followers. Followers of whom the POTUS-elect referred to saying, “ I could stand in the middle of Fifth Avenue and shoot someone and I wouldn’t lose any voters. Ok? It’s like incredible.” So SPOILER ALERT, “The Threat” is an unambiguous reference the POTUS. The book is well-articulated, newsworthy, relevant and worth the cost of the book. 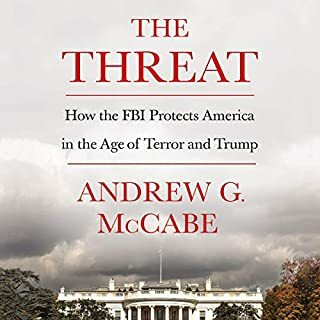 He (McCabe)narrates his own story well and credibly. I felt like I not only learned about our current state of affairs but also felt like it went far in helping to re-establish trust in a bureaucratic system that for years has been maligned and Ill thought of. Indeed, these civil servants working at all levels of government are showing at this critical time how crucial it is to our democracy to have conscientious civil servants who treasure democracy and the rule of law. It is incredibly difficult not to kowtow in the presence of intimidating personalities. Our founding fathers recognized the danger, setting up checks and balances after seeing the havoc reigning despots. We all need to cast aside rhetoric, invest time in seeking truth and act in the best interests of our nation rather than our own parochial interests. Horrendous waste of time. 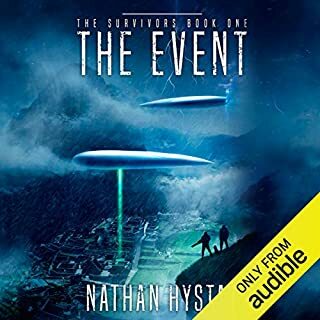 The audiobook is an abuse of a good narrator, Luke Daniels. 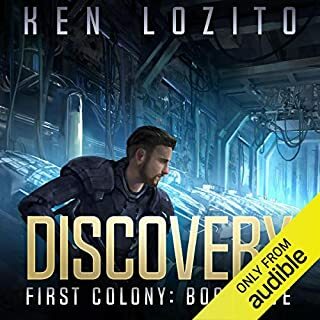 I’m shocked Audible has promoted this boring, poorly-written, Ill-conceived book. The book is full of used tropes, recycled ideas like dogs capable of sniffing out aliens. The plot jumps around dropping characters and picking up new and boring traveling companions only to find older travelers and killing them. Impossible to find rhyme or reason in the plot. The author through the main protagonist finds it unusual that a Swedish mercenary speaks English. Really? So I guess our hero is a stereotypical, clueless American who has been chosen to save the world.Then this accountant hero outruns the same merc up Machu Pichu? This is a high altitude location that commonly causes altitude sickness. The soliloquies are boring. Emphasis on slow. A book so short shouldn't have such a slow start. One of the mysteries in the book involve wondering why the main character, Conner is Mayor as well as principal explorer. We gradually discover(with Conner) mysteries associated with the NEIIS (New Earth Indigenous Intelligent Species) apparently pronounced "Newies" and Ryclar. The archaeological techniques using thermite explosives, shovels and hands seem more akin to Schliemman(who used similar techniques to excavate Troy in 1875) than a space-faring archaeologist. Disappointing. The best series in sci-fi for great characters. Delighted to hear in the prologue that we have a tetralogy with the finale yet to come. Great read! The author does well in giving Bray credit in bringing this novel to life. 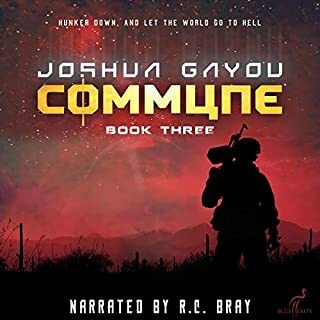 Gayou does an amazing job of taking us off into the Commune dystopia breaking all the rules and reveling in making it work. If you are old and crusty like I am you'll love it as more interesting and believable than the undead genre! The characters are unique,yet credible and address the extremes of the human condition. Language and expressions would go right over my head were it not for the Urban Dictionary. On the downside, words incorporating "lith" get overused. 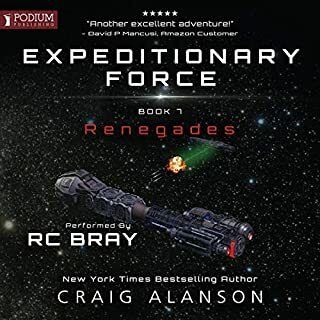 The chemistry between Alanson’s writing and Bray’s narration is responsible for me binge listening cover to cover laughing my way through. The characters have become even more credible. The Count becomes more credible. Joe’s character becomes more mature and Skippy returns in his full glory with a hilarious chapter from his POV written to mess with us monkeys. To make sense of the above you must read the previous books. Black Ops starts, reassuringly, with Skippy. The dialogue moves smoothly and kept me in tears, laughing. 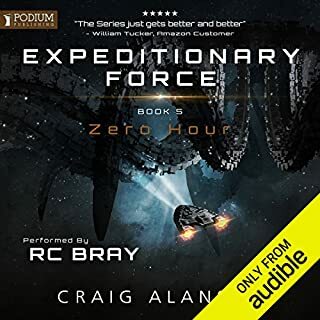 The story meshes well with the prior 3 books in the Expeditionary Force Series. After being disappointed in Book 3 I found it reassuring to see another book in line with the first 2 books. A new semi-sentient AI is Introduced, Nagatha Christy. Skippy's "progeny " comes across as a matronly credible AI brought to life by R.C. Bray sounding like Julia Childs. 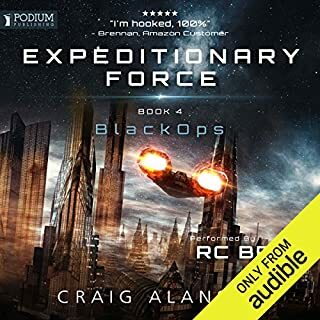 The "Black Op" is born of necessity in fits and starts to again save the world yet all works together for an overall excellent, entertaining read! This is a standing up and clapping review from a fan whose high expectations have been exceeded. Can't wait to see what next awaits the merry band of pirates. Brevity sums up this pamphlet-sized book. The book moved too quickly... except when rambling over the lyrics of a John Denver song. It is quite obviously a teaser for the next book in the series which, had it have been combined with this book, might constitute a book worth $20. The plot is good, the action and characters are familiar to us from previous books in the series. I miss the smart-aleck AI, Skippy who is only referred to tangentially as EmBe. We can only hope the next book isn't so disappointingly short. I confess to bias. 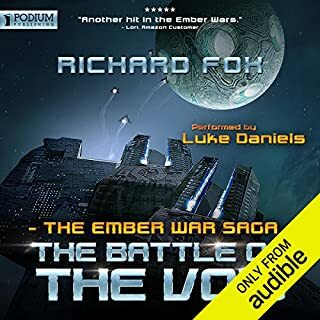 I preordered the book and downloaded Battle of the Void at the stroke of midnight. Yes, the other books in the series are that good! Fox outdoes himself in Battle of the Void. The plot is fresh and maintains my interest in the series. Luke Daniels has improved his narration and has created new voices for more characters. Yes, I got irritated as he mixed accents in earlier stories The story line is fresh. He does a superb job of unpacking and developing the Xaros. Fox and Daniels kept me on the edge of my seat as mere mortals do battle with "Uberbeings". Fox explores and develops the characters of several of the Procedurally created humans and doughboys. I enjoyed getting to know more about Makarov. (forgive my spelling as I only listen to the Audible versions of books). 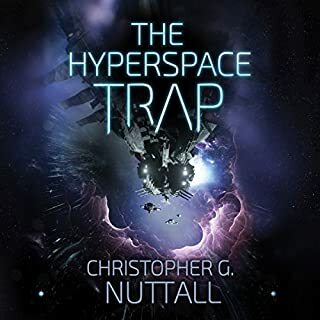 The book ranks high on my short list of great SciFi.